I make my own fly rods now but the thrill is no better than when catching on a store bought rod . I do get satisfaction from looking at them tho and I love building them . I know , I'm the exception and not the rule . Tight lines . 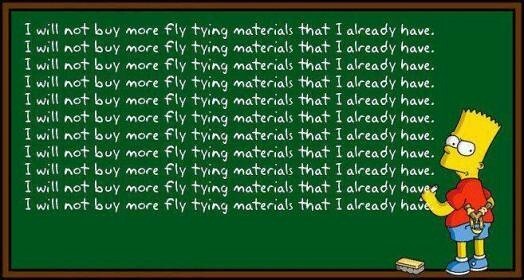 I feel the same way about fly tying. I do not build my own fly rods, but I'm sure those that do save some coin, unlike those of us that tie their own flies. I told my wife to open a fly tying material shop after I die. I was very low bux when I started out. Losing a fly was a catastrophe! I recall buying several of those "get 6 flies and a wallet when you subscribe" deals early on. They were the only flies I owned. As I fished more, I hung fewer flies in the trees and snagged fewer flies in the stream bed. I remember surprising myself by losing flies a new way: Casting too far and hooking them to the opposite bank. A little trade off- "Rats! I lost another fly!" balanced against " Wow, nice cast." Like many here, I can admit that my angling and the whole experience improved when I didn't have to sweat the $.50 price of a fly. My first self-tied fly was a hank of copper-red dolls hair (Ariel) tied to an #6 bait holder hook with black sewing thread. Goofy as it was, it was still a better angler than I was: It caught a trout while I wasn't paying any attention to it. I attributed it to someone up the chain of command letting me know I wasn't as smart as I thought I was. I tie because I enjoy it. This past September on the north form of the Shoshone, the trout were hitting Tim Ward's version of the Prince flies. Lost the few K had left. That night at the camp ground I tied more. Did not have the materials for a n exact copy so I made substitutions. The modified flies worked! Enjoyed your post and excellent member comments. The comment about making a small purchase when stopping by a fly shop to ask about local conditions, what patterns are working, and just getting advice reflects respect for their business and appreciation for their time given freely. I tie........when I sit down at my bench, everything else fades away and the tying is the focus.........something money can't buy. I'll chime in because my perspective is a little different. For me, tying hasn't become a hobby. I mostly fish the same 5 - 10 flies. (Actually more like 3). So I buy the materials to tie those and also big streamers (half chickens) and that's it. Yes there is a substantial upfront investment but over time it levels out. For example, squirmy wormies cost me about $0.30/each to tie. Per 100 I have $30 invested. At the fly shop they are $2 - $2.50. $200-30=$170. Paid for my vise and tools on the first 100. Same for midges and pheasant tails. I may have 20-30 cents each in them. Big streamers save me big time money. I'll have $3 in a streamer that I'd buy for $8 - $12. I really don't tie anything other than my staple "guide flies." I buy everything else because I want to support the fly shops in the destinations we fish. With that being said, everything said above by everyone else is true too. If it becomes a hobby, no way does it make sense financially. I bought all the stuff to tie with cause I thought I'd like to have a hobby . I opened the kit and there it sits . Still have absolutely no interest . Why would I When I can get anything I want $7 a dozen on ebay ? I don't tie for fun. I tie to have flies. It's not a hobby for me. But since the mid 70's I've tied nearly every one of the flies that I've used. For me, using my own flies is part of the deal. If I used 'store bought" or someone else's flies, that would lessen any accomplishment. I just don't do ithat. But I don't spend a lot of money on every new product that comes down the pike. I blow through buck tails, saddle hackle and hooks, but beyond that there's not a lot of expenditure. Just like anything in life.... you can vacation, buy a car, eat, golf, even tie flies on a budget. I started out that way. I grew up with very modest means. One Christmas I asked for a fly tying kit. It was the entry level Cabelas kit and that's what I used from 16 - 28 years old. I added little to that kit for years. I tied maybe a dozen patterns, shot grouse and deer and other game that were essentially free. The only major expenditure was hooks. Now since then....I've graduated college, paid off my student loans, and saved for tomorrow. I've graduated to better equipment and materials because I've earned the right to do so. It's the only major hobby I have. I don't have a boat, I don't use Summer as a verb, have gun collections, motor cycles, etc....so if I spend $100 on some capes, feathers, and dubbing......then I can still sleep at night. It gives me a sense of pride, accomplishment, and I enjoy looking at a well tied fly. I enjoy researching old patterns, the men that have been innovators in the sport, and the truly amazing tiers and their creations that are in the sport today. So it's a personal choice....do I tie to subsist, tie for fun, tie to hang on a a wall, or tie to eventually be in a museum? It's up to you.....I would guess most just enjoy tying flies to pass the time, share a few with friends and family and connecting with a fish once in a while. 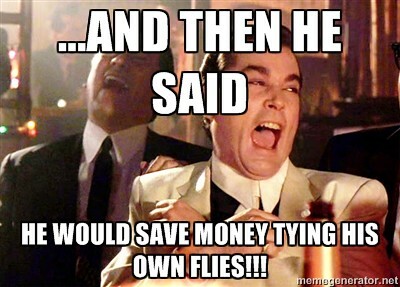 I personally could not imagine if I had paid $2-$7 for every fly I've lost...... I would have learned to be a pretty good tree climber or snorkeler for sure. Being able to customize patterns is the biggest advantage for me. I doubt I will ever end up "in the black" with this hobby. I also tie a lot of flies to give to friends. If I jump on someone else's boat, chances are, they won't take any gas money from me. So I hand them some tried and true flies that I took the time to make with better hooks, materials with more movement, variations in weight, or just tied with more attention to detail toward making them more durable. This goes a long way with people, and it gives me practice and feedback in order to improve.